Islamists Select a New Target, and a "See No Evil"
PJ Media recently published a fascinating yet troubling Islamist Watch article by Marc Fink about Turkey's intense cultivation of ties with Native American tribes: tribal students now study in Turkey with full scholarships; Turkish high officials regularly appear at Native American economic summits; and dozens of tribal leaders have gone to Turkey on lavish all-expense paid trips. The effort culminated in a Congressional "Trojan Horse" bill that would give Turkey unfettered access to Native American tribal lands. Most astounding, 220 representatives voted in favor – representing both parties and all ideological strains – with 160 opposed and 49 abstaining. The bill failed only because it required a two-thirds majority for a "suspension of the rules" vote. The bill, or one similar, could come up for a vote again, at any time. 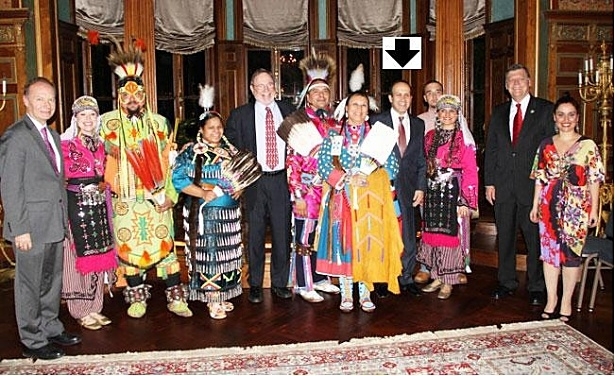 Turkey's Ambassador to the U.S., Namik Tan (arrow), hosts Native American tribal leaders at Turkey's Embassy in Washington. At right is Oklahoma Congressman Tom Cole (member of the Chickasaw Nation tribe) who introduced a "Trojan Horse" bill that would give Turkey unfettered access to Native American tribal lands. At left is Turkey's long-time chief lobbyist in America, Lincoln McCurdy, head of the Turkish Coalition of America.